Collect survey and ePRO data from anywhere, in real-time, from study participant mobile phones. Data collection and Electronic Patient-Reported Outcomes (ePROs) are some of the biggest challenges during research studies, and becomes more difficult as research studies increase in duration and complexity. Text messaging is one of the most powerful data collection methods. Mosio offers several solutions to assist with gathering critical patient data for your research. Whether you want to deploy SMS surveys or simply use text messaging as a way to remind volunteers to complete surveys/diaries/journals on paper, apps or through the internet, Mosio helps you achieve greater levels of success in collecting your data when you need it, consistently. 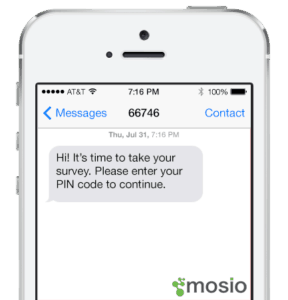 Mosio enables you to configure and deploy text message surveys for data collection or as part of the process for qualifying and recruiting participants for studies without having to download any software. Our Storyline Alerts™ feature enables you to easily schedule a series of days/times to automatically send surveys. All types of survey response formats are available, including Y/N, A-E multiple choice and user-defined character sets for quality of life (QOL) and study surveys. Since 90% of mobile phone users read a text message within 3 minutes, the text message is the most effective method to ensure patient compliance and consistent data collection in your study surveys. Need to integrate with REDCap or other EDC systems? Our development team has the proper experience to work with third party vendors to meet the technical requirements of your study. Sometimes sending the survey isn’t enough; participants need a gentle nudge. 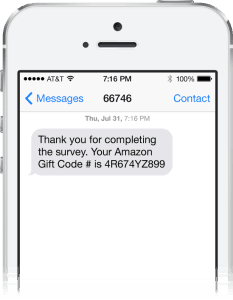 Mosio customizes text message reminders for incomplete surveys, whether those surveys are conducted on our platform or anywhere else. These reminders can be a part of your survey module functions or can be used as an effective reminder for participants to complete surveys on paper, mobile app or website. 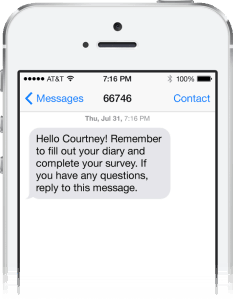 Although diaries may be filled out on another mobile device or online, the text message reminder is an effective way to ensure patient compliance and completion of ePROs. Reminders can be automated on a schedule-based timeline or triggered through non-completion events. Offer real-time incentives for taking action by deploying gift codes and rewards to participants who successfully complete surveys. Mosio handles the heavy lifting so gift codes are only used once and then discarded to avoid confusion and frustration. We’ll offer guidance based on your study type and protocol, in order to achieve maximum success. Ensure your study participants are the ones receiving your messages or responding to survey questions. At the beginning of the project, study staff enroll participants into the Mosio system and ask them for an easy-to-remember PIN, which becomes the participant’s mPIN™. Staff then explain that at certain points in the study (a private message, survey, questionnaire, etc), participants will be required to respond with a PIN via text message before messages (or series of survey questions) are sent. 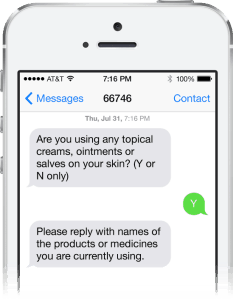 Mosio is a two-way text messaging company specializing in mobile solutions for clinical research. Our award winning Patient Engagement Platform enables researchers to engage and retain study participants through text message alerts, reminders, surveys and interactive “TextChat” features. Text STOP to 66746 to opt-out. Text HELP to 66746 for help.